In Atlanta (bottom), alumni volunteers teamed up with students to spend the day working on projects at the Atlanta Community Food Bank, the Furniture Bank of Metro Atlanta, and the Hosea Williams Feed the Hungry and Homeless project. This initiative supports a recent surge of high-profile efforts to help the homeless in Atlanta, in which Emory alumni play key roles. 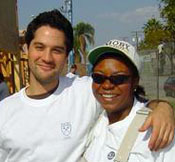 In Los Angeles (left), alumni turned out for what coordinator Jamila Fairley ’96B jokingly reported to be a “nail banging success” and a “hammering good time”—the group made the serious commitment to build a Habitat for Humanity house. In Miami (top), volunteers at the Daily Bread Food Bank were joined by a special guest: President Jim Wagner, who was visiting alumni, parents, and friends of the University in South Florida. 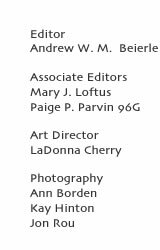 Former Board of Governors President Renelda Mack ’83C was part of this effort also, which was organized by Karen Zinn ’82C. Mack was the first to envision and promote the alumni community service day some two years ago. “In the spirit of unity, Emory graduates, parents, and friends inspected and sorted food—more than 4,164 pounds, to be exact!” Mack said. 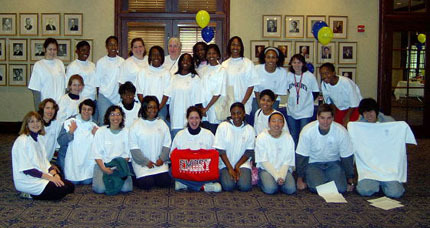 Other cities in which alumni participated in Emory Cares included London, Austin, Chicago, Houston, Minneapolis, Nashville, New York, Philadelphia, Phoenix, Seattle, and Washington, DC. Emory Cares 2005 International Service Day is scheduled for Saturday, November 12, and will have the theme “The Fight Against Poverty.” Mack will serve as the Emory Cares ambassador and, with the Association of Emory Alumni, plans to increase the number of cities participating. The AEA is currently working with CARE to explore the possibility of organizing a leadership seminar for Atlanta-based Emory alumni to fight poverty. For more information, visit www.alumni.emory.edu.—P.P.P.